Three thoughts on the Utah Jazz’s 120-90 win over the Portland Trail Blazers from Salt Lake Tribune Jazz beat writer Andy Larsen. Portland’s defense is designed to make opponents take mid-range shots. They do this by dropping the center so low in pick and roll that all of your space is in that area of the court. But the Jazz don’t really have good mid-range shooters other than Donovan Mitchell, and he shot just 1-10 tonight. So what do you do? You don’t just run vanilla pick and roll. You don’t settle. You move. The defense can’t just “stay at home," they have to deal with threats and problems. The Jazz did this utterly brilliantly today, and it led to their second consecutive game with 30 assists — the first time that’s happened since 2011, according to the stats folks at Jazz TV. Friday night, it was 35. Here, Ricky Rubio — who had a fantastic night, 24 points on 10-15 shooting — sees the paint is clogged. So he “Nashes” around the baseline, knowing the defense will collapse at some point. They do, and Jae Crowder is open for three. On this play, Kyle Korver misses a three, but Rudy Gobert, known tall person, gets the rebound. Watch Korver absolutely sprint 50 feet from one side of the court to the other, moving the entire defense. Where is there space now? Exactly where Korver was before, and Gobert makes a brilliant pass to Rubio for the three. A lot of this is improvisation, honestly. 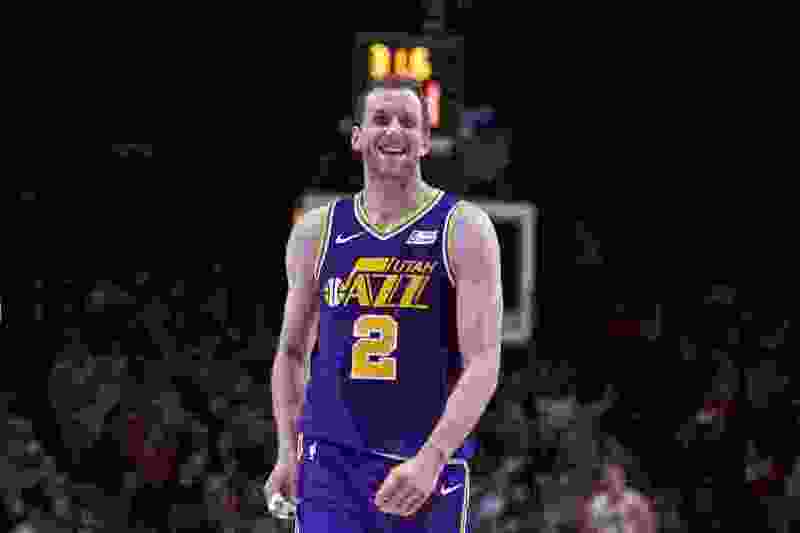 But improvising with force is a big deal: rather than just watching their teammates make a play, the Jazz are figuring out what they’re going to do next and thinking about how that will open up the next thing. Are they going to shoot this well frequently? Of course not. But what was so encouraging about the offensive performance tonight was that it was a good one even if they had just made an average number of threes. That’s now the Jazz’s fifth consecutive game holding their opponents below a 100 offensive rating, and I think they’re unfortunate to only have a 3-2 record during that stretch. Damian Lillard and C.J. McCollum are both scoring guards, just like the Warriors' starting backcourt, but the Blazers guys usually get their points off of an on-ball screen. So on Friday night, the Jazz’s number one priority was to defend the ball screen well, and in particular, sell out whenever possible to prevent the Blazers' shooting guards from getting space. One way to do this is to prevent them from using the screen at all, with the defender positioning himself between the screener and the ball-carrier. That means in order to prevent a straight-line path to the basket, the Jazz’s big men have to help, leaving the Blazers' center, in this case, Jusuf Nurkic open. But then the Jazz collapsed on Nurkic, making his life difficult. Portland coach Terry Stotts had another option, then: rather than play the rolling Nurkic, who could be helped on from all over the court, why not play one of their assortment of shooting centers, like Meyers Leonard or Zach Collins? That way, help couldn’t come so easily from anywhere. That did work for a bit, but the Jazz started rotating helping off other shooters to make those guys into playmakers, something they may not be naturally great at. The other thing that happens when you try to make great scorers give the ball up time and time again: they try to get theirs anyway. McCollum is absolutely capable of making this shot, of course, but just going iso on Joe Ingles with that much time left on the shot clock isn’t wise. Just really well done all night by the Jazz, who showed attention to detail and effort to make everything work. Exum scored eight points and had eight assists tonight, not really eye-popping numbers. But his contributions in his stints off the bench in this game were some of the very best basketball I’ve seen him play. The defense was very good. While he only spent a couple of minutes on Lillard, he did a nice job of staying close and keeping his hand high, again doing his best to make Lillard into a passer. That first clip really impresses me because of his maturity. He has the first option for Korver, but doesn’t have it, so passes to Favors for the hand-off. That’s not really there either, so he takes a beat, allows Favors to flip his screen, then attacks the rim. That lob pass has to be exactly on the money, and it was. One major criticism of Exum’s game is his ability to be a floor general, but that’s exactly what he showed in Portland Friday night. If this is something he can continue, it makes the Jazz’s bench unit much more dangerous, and gives Exum a chance to play even more minutes on nights where Rubio is struggling.